It is important to learn how to train your brain to focus so that you can use your precious time more productively. Your brain needs to be focused on a task like preparing for a meeting with a prospective client if you want to complete it successfully in a lesser time. However, your mind may not allow your brain to focus. It can take your focus away from the details of the meeting with a client to the meeting with friends or an outing with family. According to a study published in the Neuropsychiatric Disease and Treatment, there is a need to address the issues related to the decline in the executive functions of the brain such as focus, attention, and abstract reasoning to enable managers to work more efficiently. In this article, we will learn some simple ways for how to train your brain to focus so that you can swift through your multiple responsibilities more efficiently. Some of the tips mentioned beneath are to be followed before you begin your work and some can be practiced while working. Our brain tends to associate certain tasks with certain environments. For example, you feel like working out or doing weights training when you enter a gym even if you are there just to visit a friend. Similarly, your mind immediately enters a serene zone when you visit a yoga center or a place of worship. This tendency of the brain can be utilized to your advantage to learn how to train your brain to focus. You can pick a specific location that you want to dedicate to do tasks that need complete focus. This will be the location that your brain will get used to as an environment where no distractions can affect you. Make sure you work on all important tasks at this location. Over a period of time, your brain will recognize this area as a place where distractions are not allowed. This will train your brain to focus and prevent it from wandering off. Place a therapy lamp at the place you want to dedicate to focus. It has been found to produce an effect similar to that of antidepressants and boost moods. Researchers at the Harvard Medical School and the Mayo Clinic have recommended using a therapy lamp to manage seasonal disorders and restore balance. Research conducted at the National Academies Press has shown that insomnia is associated with reduced focus, loss of memory and attention span. Inadequate sleep at night can reduce the ability of your brain to focus during the daytime. Making sure you get a sound sleep of at least 8 hours every night will improve the functions of your brain and train it to focus better. Some simple ways to beat sleeplessness include setting a fixed time to go to the bed and aromatherapy with lavender oil using an aromatherapy diffuser. Exercises can stimulate the body’s senses and even improve the brain performance dramatically. Hence, performing exercises like walking, or even simple push-ups and sit-ups is recommended to improve your focus. Your life is a mix of multiple commitments and varying experiences and situations. On some days, you may feel good for something positive happening in your life. On other days, you may feel nervous or frustrated due to an impending appraisal or a low rating. Your mind is bound to be crowded with the positive or negative thoughts related to these circumstances. And once a specific non-work-related thought enters your mind, your brain takes it from there and keeps pondering over it. This may land you in embarrassing situations if you are in the middle of a meeting and someone catches you smiling at yourself. Avoid it by taking note of the thoughts that enter your mind. Writing down your thoughts will allow your mind to stop worrying, daydreaming or thinking more about them. You know you have safely recorded your concerns, and you can address them later. Your wandering mind is conveniently supported by the number of distractions surrounding you. Such as the notifications on your smartphones and even the news you read in the morning. So, even while trying to focus on the agenda for the meeting, your mind may actually be thinking of the upcoming elections or the soccer matches in the evening. The email and social media notifications as trivial as a ‘late’ good morning message can take away your focus from the task. You can learn how to train your brain to focus by avoiding these distractions. Turn off the notifications while you are working on important tasks. You can also shift your news-reading session to evening instead of morning to keep up your focus on the work during office hours. You can also use a mist to be able to focus better on hectic days. The attention span, or the duration for which your brain can focus, is about 50 minutes. According to the research conducted at the Aging Clinical And Experimental research, your attention span can reduce further with advancing age as your brain wears out. You can plan ahead and learn how to train your brain to focus to prevent the age-related decline in your attention span. 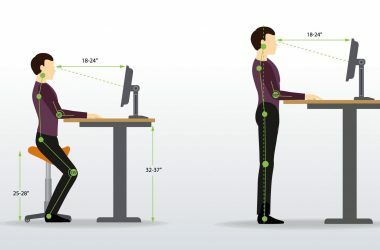 Take frequent breaks of about 15 minutes after every 40 to 50 minutes of work. That can help you stay focused and prevent the wearing out of the brain. The focus is like a muscle. Just like you work out your muscles in the gym by lifting weights, you need to work out your brain to improve its ability to focus. 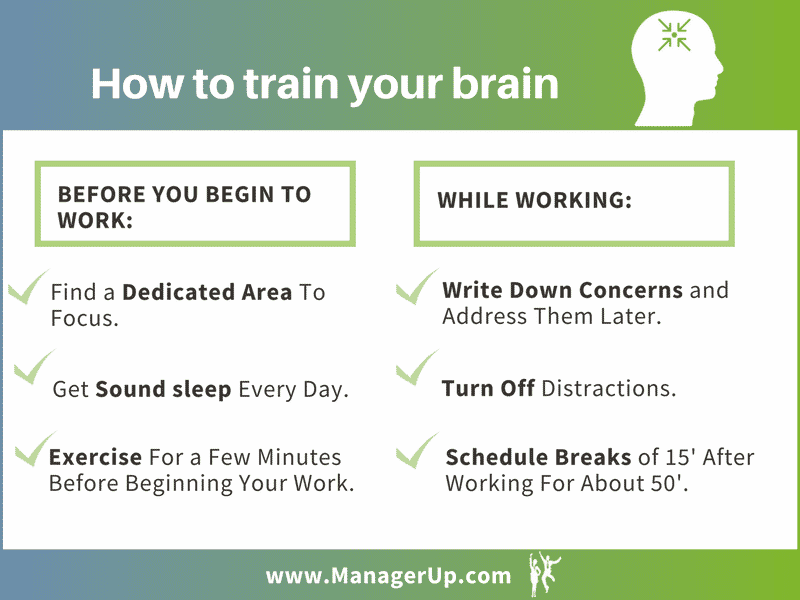 Practicing these strategies for how to train your brain to focus will improve your concentration and help you be more successful in business. You can also take a look at these books specifically meant for the executives to help them increase their focus and productivity. You can try these tips and share your experience with us by leaving a comment below.